So many of my lovely readers email me and tell me that they love to use my baby hat knitting patterns to knit for charity. This makes me so so happy to hear. If that’s you, thank you for contributing your time, and energy and craft to making the world a better place. Using creativity to spread kindness is such a wonderful thing. I thought today, that some of you might also wish you could start knitting for charity or doing crochet for charity. But maybe you don’t know where to start? Maybe you don’t know where to donate baby hats to charity? I know, it’s so overwhelming! So I’ve done some research and I’m ready to get you all started crocheting or knitting baby hats for hospitals and other charities. And don’t worry, my list of groups that accept hats for charity includes the US, Canada, the UK and Australia! When you’re crocheting or knitting for charity, it might be tempting to just knit or crochet whatever you want and send it off. But I discovered that many places that accept baby hat donations actually have fairly specific requirements that must be followed for your donated baby hats to be accepted. Donated handmade crochet or knit baby hats should be from smoke free homes. Stick to super soft yarns made from acrylic, cotton and bamboo. Alpaca, which is hypoallergenic, is sometimes allowed. Some charities have specific yarn color requests and some do not, so make sure to check before you start, many times you do not have to limit yourself to typical baby pastels! Where can I find good baby hat knitting patterns for charity? 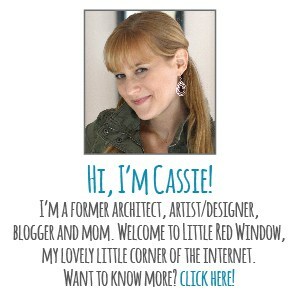 A great place to start is my Back to Basics series of patterns which all have a free version. These simple patterns can be customized in tons of different ways and are great for knitting for charity! Where should I send my baby hats for charity? 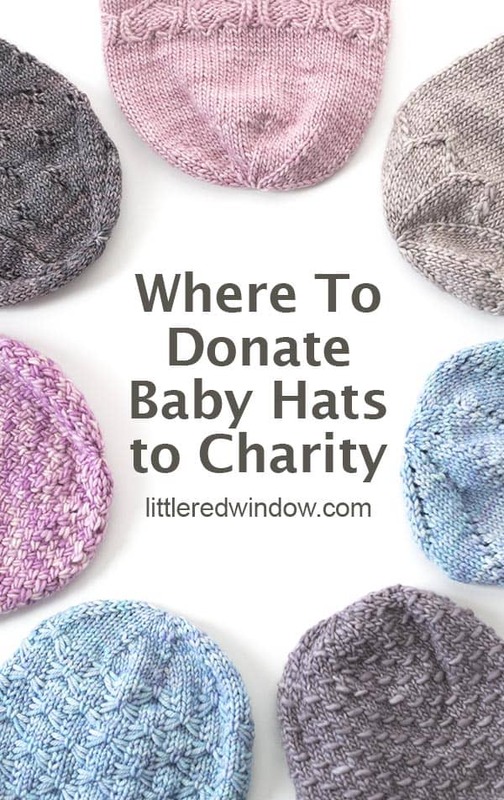 Now that you know what kinds of baby hats to knit or crochet for charity, let’s talk about WHERE to donate baby hats. I know for me, this was the most daunting part of wanting to start knitting for charity. For many people, the easiest place to donate baby hats is your local hospital. But be sure to call first and ask if they accept baby hat donations and what their needs are. If you can’t find a hospital in your community that accepts baby hat donations, then I’ve got you covered! 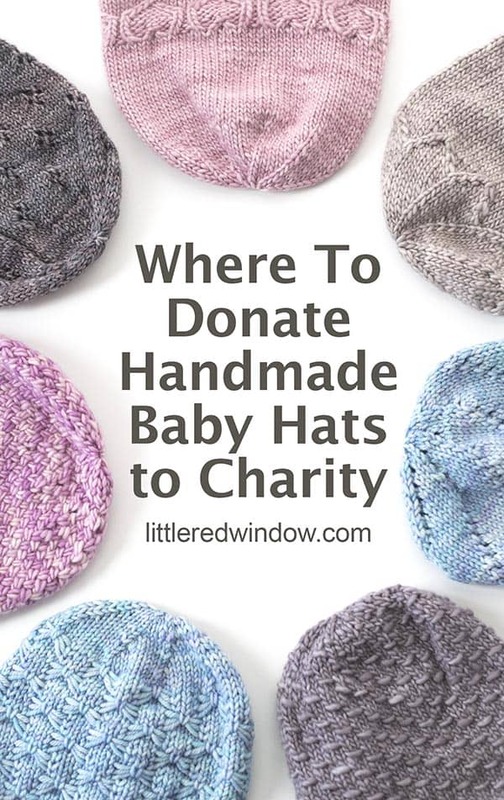 Here’s a list of charities that will love your handmade baby hats! If you find anywhere else with clear baby hat donation guidelines, please let me know and I’ll add it to the list! ‘Knitters for Charity’ is my group in Pasco County FL. Donated 53,000 items since 2010. More than just hats! Please add my group: The Tiny Toppers of Maryland to your list of possible donation places. Thanks for telling everyone NO WOOL only soft baby hat yarn…and maybe save the darker colors for fall. Happy Easter!!! The hats we make are taken to 5 area hospitals for the newborns!! !